Millions of ‘attractive’ sterile fruit flies are being dropped from the sky over Adelaide as the $45 million fruit fly fight continues. 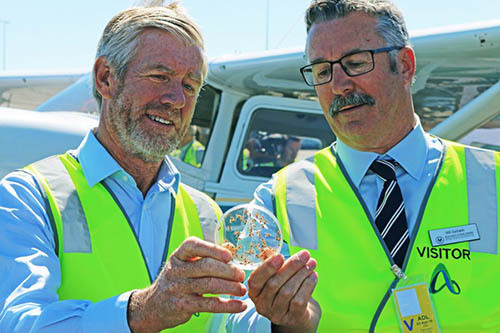 This is the first time Queensland fruit flies (Qfly) sourced only from the new National Sterile Insect Technology (SIT) Facility in Port Augusta have been used SIT to assist with incursion eradication. Minister for Agriculture and Water Resources, David Littleproud, today watched the flies descend from the Adelaide sky. “Australia is at the cutting edge, using new technology to manage farm pests. We have developed the unique SITplus program based on SIT programs that have been effective in California and Guatemala,” Mr Littleproud said. “SIT introduces large numbers of sterilised fruit flies in key areas to stop wild flies breeding. “Our SITplus program includes work to develop the most attractive fruit fly for native flies. “These sterile fruit flies, 50 per cent male and 50 per cent female, have been raised to be more attractive to the wild population, showing that beauty is truly in the eye of the beholder. “These flies are the best ‘singers’, have great endurance, fitness, agility and looks that are irresistible to wild flies looking to breed. “Among the other SITplus developments is a gel diet to help raise more sterile flies more consistently, work to build up male-only offspring and piloting the National Sterile Insect Facility in Port Augusta, which will produce up to 50 million sterile male Qfly each week when fully operational. “This full-scale launch follows a successful trial of an aerial release of sterile flies in March. There will be continued releases and further development of the technology. “SIT is a game changer for Australian horticulture, enabling farmers to reduce their pesticide use, expand their production of high quality crops that are free of Qfly and capitalise on our trade wins. John Lloyd, chief executive of the grower-owned research and development corporation that initiated the SITPlus initiative, Hort Innovation, said today was a momentous day. “We have had some of Australia’s leading Queensland fruit fly specialists working on the development of the sterile Qfly and preparations for releases for the past four years,” he said. “The fruit and vegetable industries have also played a key part in making today happen, with this initiative being backed by citrus, cherries, apple and pear, summerfruit, table grapes, strawberries, and vegetable levies from the start. SITPlus is a $45 million research and development partnership, with nine separate projects targeting Qfly. Funding partners include Hort Innovation—through levies and matching Australian Government funding—Macquarie University, the South Australian, Victorian and NSW Governments, the CSIRO, the New Zealand Institute for Plant and Food Research, and a range of levy paying industries. The Government also invested $2.35 million through the Rural R&D for Profit program to develop guidelines for the release of SIT flies through an area-wide integrated pest management program, to create the optimal conditions for SIT fly releases to be successful. Qfly costs the horticultural sector $300 million in lost markets and damaged produce.